Do you see the people you serve? From time to time, our family will feed the homeless with a local group. It’s a multi-church ministry where a different church is responsible for feeding and serving several hundred meals on their assigned night. They have always been very gracious letting us jump in with whatever church is serving. We have loved our evenings there. Tonight our hearts were ready. We were all excited. It was going to be the first time my youngest joins us. We walked him through the process as best we could. From the moment we arrived though something was different. Something was off. The 3 men and a guitar were still playing praise music. The donation tables were set up beautifully with clothes and toiletries, even a Lion King DVD. The aroma of chicken and potatoes coming from the kitchen smelled delicious. I introduced myself, explained that I had called earlier in the day to confirm we could help serve tonight, and then introduced my children to this new group of volunteers. The well dressed man was polite. When the hungry people arrived, we each took a tray in the kitchen. A woman barked at my middle child, “I will not allow you to hold a tray! You will spill it all over the floor.” He explains he has done this before and is really careful. “No!” Hum… We make a new plan. I will carry the tray, my kids can remove the meals and serve them to the people at the tables. A few minutes later we are again reprimanded by a second volunteer who had decided that all tables must be served in a clockwise order. I respectfully smile but think “really lady?” My usually energetic children are abnormally well behaved…too behaved for my taste. I can see them deflating in front of my eyes. Where is the joy in the room? Isn’t that the point of the evening… to offer a small dose of encouragement to our brothers and sisters who are hungry. I hand each of my kids a tray of their own, bucking the “system” for dessert. After everybody has a sweet treat, we return the extra cookies and cakes to the serving table. A third volunteer now approaches us with deep anger, “You are NOT allowed to give them a second dessert! !” I can feel my fearful childrens’ fingers grip into my legs. My smirk though is undeniable and I’m holding back sarcastic laughter at the irony of the 50 extra uneaten desserts in front of us. I gently respond, “We actually haven’t given anybody a second dessert…yet.” She insists the weak , emaciated man in the yellow jacket had both a cupcake AND a cookie. At this point, I’m over it. I grab my children and we head straight for him. We sit, talk ,and pray with him over his tumor and hospitalized son, and then give him a piece of Key Lime Pie. Yup, that’s 3. My son gives him a hug and promises to keep praying for him. There’s now a line of others with their own prayer requests. They just need somebody to ask…somebody to see them. The ten volunteers, with their backs against the wall and nothing left to do, stare at us, not sure what to make of our rebellious interaction with these hungry folks. How often do we get so wrapped up in the order of things and controlling a situation, that we forget why we are there? Tonight, joy was lost, the opportunity for relationship diminished, and the normally energized room, smothered by rules. 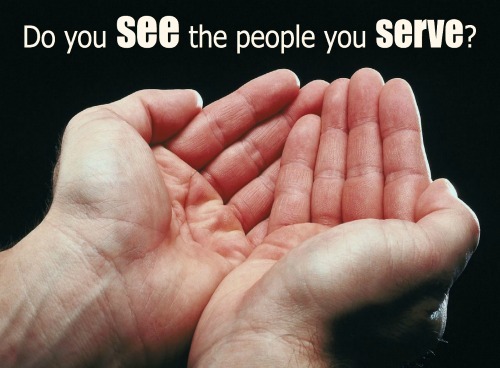 We get so focused on “how to serve” that we don’t see the people we are serving. I do it too. I was in the grocery store last week trying to check out. I was talking on my phone, stopping my kids from sneaking bubble gum into our basket, and trying to swipe my credit card. As we left, I realized I forgot my sunglasses and turned right back around….but I had no idea who had just checked me out. I had never made eye contact. I never saw him. Sometimes it takes seeing something in other people to realize what you don’t like in yourself. It may be packaged differently, but I too am guilty. In the demands of my day, I don’t always see the people in front of me…including my children. Hoping tonight serves as a reminder to open my eyes to the eyes looking at me. This entry was posted in blog, Motherhood, NrelateShare and tagged character-building, homeless shelter, parenting. Bookmark the permalink. Thank you for this post! As I try to serve with my kids each day, your experience is a situation that we have run into as well (thankfully, the negativity isn’t too often). Thank you for your example of teaching your children to love others! It’s so easy to caught up in the rules because we want everything done perfectly… everyTHING… but you are right, it’s people we come in contact that truly matter, not things. Wow; this breaks my heart. 🙁 You’re right – we’re all guilty of failing to “see” people sometimes, and I am grateful for the reminder! But how sad to go out of one’s way to “serve,” when one’s heart is not for serving. And worse still, how it must grieve God’s heart for one to DISCOURAGE another from serving. Made me cry, Alli. Thanks for sharing. I love your posts. I sat for a few minutes after reading this and was thinking that not only did you serve the homeless, you also served the other volunteers that night. Maybe they saw that you provided much more than order and sustenance. You fed the homeless what they were really hungry for. They sought love, respect, kindness, someone that noticed them as a whole person, and most importantly they were yearning for God and His love. .
Janette, I am thankful for that evening because it reminded me of all the times, my heart was right but my actions were off. I needed to see it in somebody else to remember where I wanted my gaze to be. I often get distracted by the checklist of life that I fail to see the people in front of me. Hoping my heart stays soft in this area. Thank you for reading and commenting.